Available for $795 + $160 per year, Fast DBTools provides tools that operate many times faster than standard utilties, as well as time-saving tools not otherwise available. 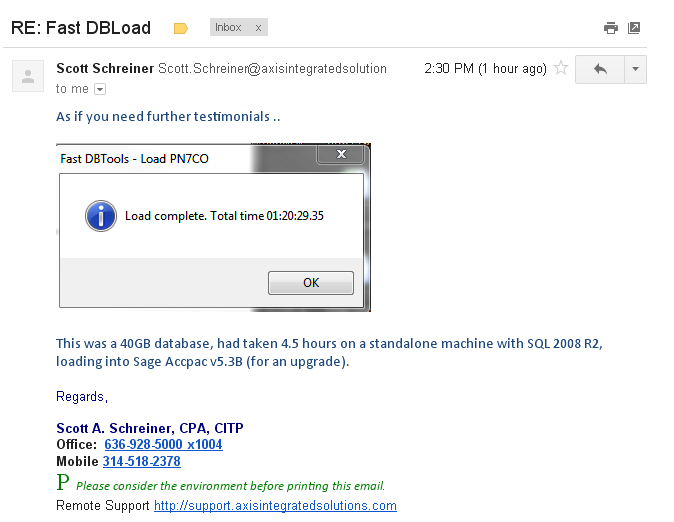 "As if you need further testimonials ... Load complete in 1:20 ... a 40 GB database, had taken 4.5 hours" Scott A. Schreiner, Axis Integrated Solutions. Show complete quote. 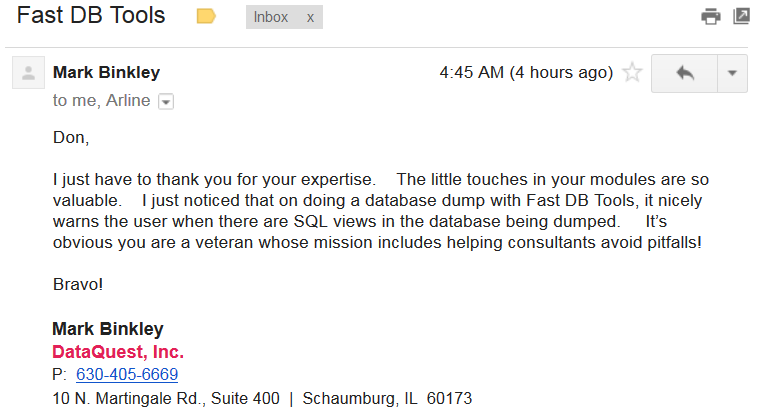 "the little touches ... are so valuable ... a database dump ... nicely warns the user when there are SQL views in the database" Mark Binkley, DataQuest, Inc. Show complete quote. An interactive console, shows Sage 300 databases with information specifically relevant to Sage 300 operation. The console provides a consolidated launching point for various database functions including database creation and setup. NEW: Fast and Safe DBDump! Yes you can do an Administrative Services DBDump while users are editing data! The resulting data may or may not be consistent. With one click on our "Require Exclusive Access" checkbox, exclusive access to the database is gauranteed during Fast DBDump. • Fast Load: A database load will take a fraction of the time taken by the standard utility, typically 3x to 4x faster. Show me. • Fast Dump: Any number of Sage 300 databases can be dumped in a single, unattended operation. Dumps are performed with multiple threads, speeding up overall operation. • Fast Copy: Database copy operations will take about 60% of the time taken by the standard utility. Further, databases can be copied from one SQL Server instance to another, eliminating tedious context switching operations. • Safe: A "Require Exclusive Access" checkbox has been added to the Dump & Copy forms. When checked, a dump will not proceed unless exclusive access to the database can be acquired. When unchecked, Fast DBTools will still attempt to get exclusive access, but will proceed if unable to do so. A dumped or copied database may not be consistent if users are able to make entries during the dump. Show me. • Safe: NEW - You will be warned if a database being dumped has stored procedures, views, triggers, extra tables or extra columns that will not be saved in a dataset. Show me. • Safe: NEW - A database’s collation is now recorded in the dataset. If a user tries to load a dataset into a database that has a different collation, a warning will be presented. 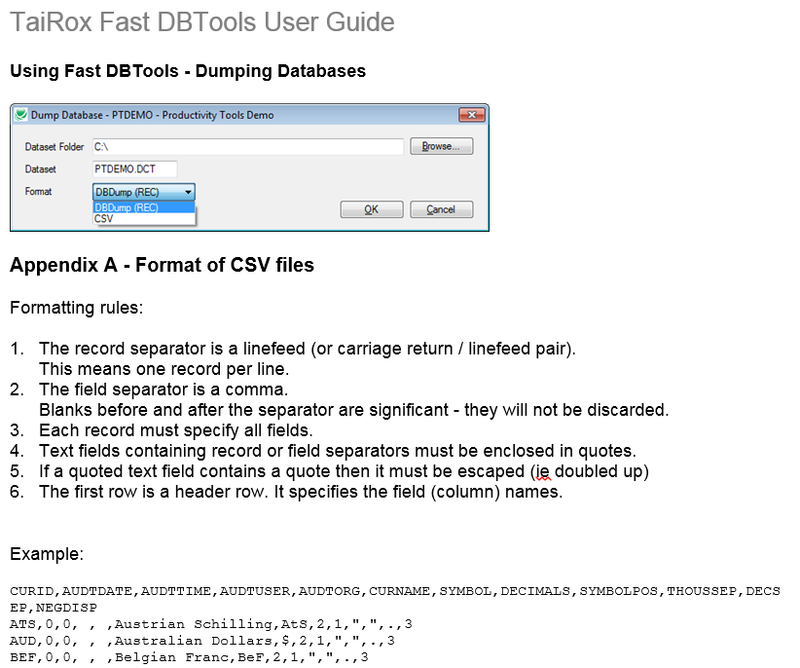 • Visibility: Fast DBDump will dump data in a readable CSV format as well as to the standard REC format. Show me. • Visibility: All Sage 300 databases are displayed in a sortable, Sage 300 centric grid with Collation, Recovery Model and Log Space Available columns. Icons on the display separate Sage 300 and non-Sage 300 databases (e.g. CRM or Portal databases). The icons also indicate whether or not a Sage 300 database is connected and usable (a Database Setup entry is present). 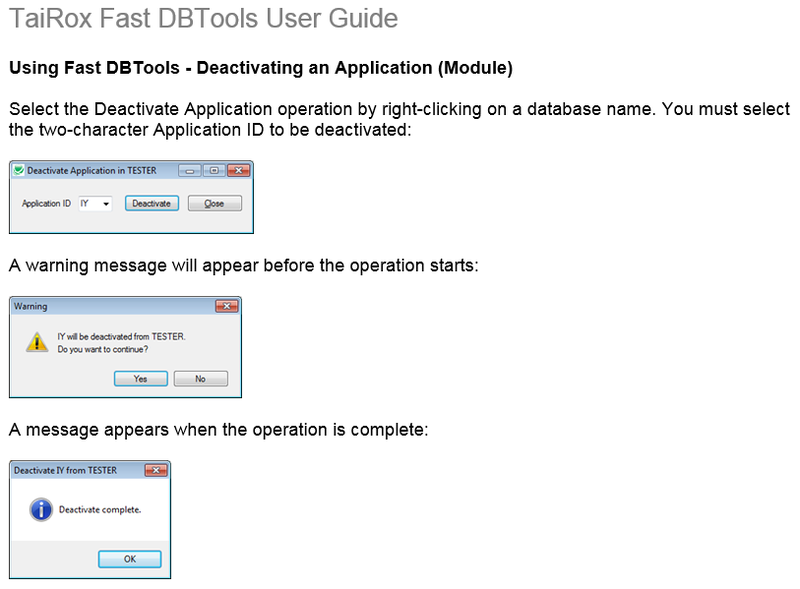 • From One Place: NEW - A new Sage 300 database can be created or deleted without using the SQL Server Management Studio. When creating using an existing database as a model, a Database Setup entry will be created with the same credentials. When deleting, a Database Setup entry will be deleted. • From One Place: A Shrink Log button quickly recovers unused space in database logs without using the SQL Server Management Studio. • From One Place: A convenience feature when loading a database allows you to set the Common Services company name to match the description in the database setup tables - saving time when repeatedly loading a test copy of a database. • From One Place: When creating a new database using an existing database as a model, you can enter the database description which will be used in the Database Setup entry. • No Other Way: A deactivation operation cleans up tables created by old, unused modules. Two character prefixes being used in a database are shown for selection. Show me. • No Other Way: A Dataset Explorer will open and display REC (or CSV) files without loading the entire database, which may take minutes or hours for large databases. 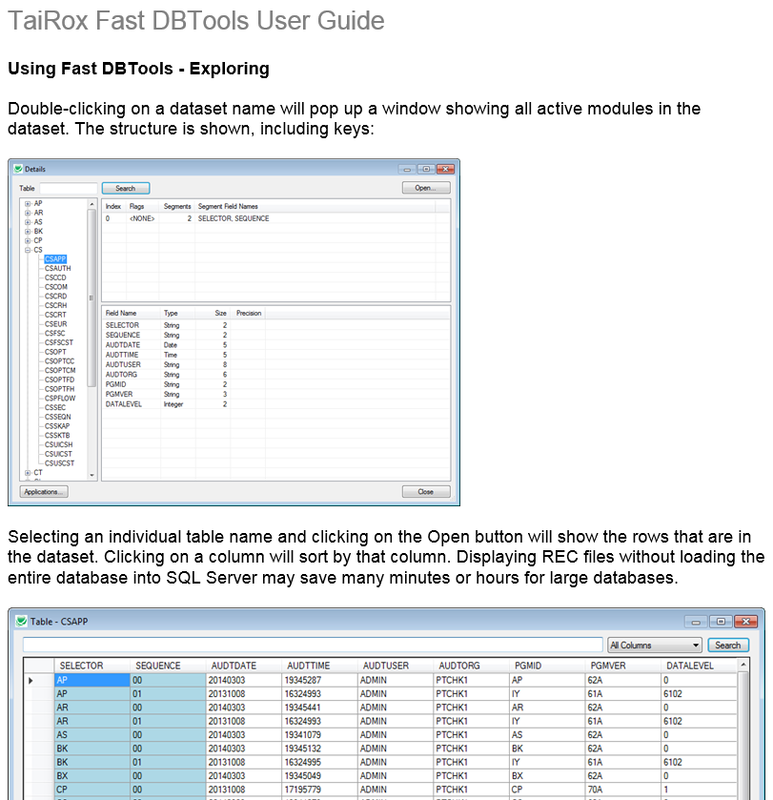 If you associate DCT files with Fast DBTools in Windows then opening a dataset results in Fast DBTools being started and the Dataset Explorer being opened to the folder containing the dataset. Show me.